I had La Vic’s (short for La Victoria Taqueria) after going to the Star Wars exhibit at the Tech Museum on Presidents’ Day. When I was attending SJSU, I’d go to La Vic’s frequently. The SW exhibit was originally to end at the end of February, but due to popular demand, they’re gonna stay till end of March! Get the discounted prepaid tickets from Costco (2 for $29.99), and then secure the actual physical tickets at the museum in advance, before they run out. Oh, and pay a difference of $5/person for the Millenium Falcon experience. That’s $20/person instead of $27 (Jedi package = SW + MF exhibits). I ordered a quesadilla. 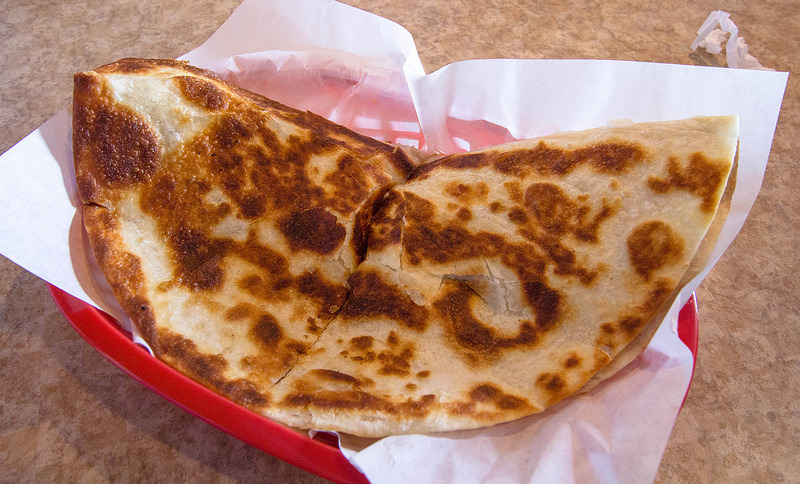 La Vic’s Super Flour quesadilla has cheese, sour cream, guacamole, fresh salsa, & your choice of meat. I chose al pastor. The meat offered were carne asada (steak), carnitas (braised pork), pollo (chicken breast), pollo asado (grilled chicken), buche (pork), chille verde (pork in tamatillo sauce), lengua (beef tongue), chorizo (Mexican red sausage), and al pastor (marinated pork). I also ate the quesadilla with La Vic’s famous orange sauce.